One of Aaron Hernandez’s defense attorneys challenged a state police fingerprint examiner Wednesday, suggesting that his work was sloppy, that his testimony was incomplete and that the science involved is subject to human error. Attorney James Sultan also hammered on a theme he has used with other witnesses testifying about fingerprints – that there is a well-known phenomenon known as "confirmation bias," a situation in which experts make determinations based on what they believe they "hope or expect to see." Trooper David Mackin didn’t yield, testifying that he believed the process used by Massachusetts State Police fingerprint examiners eliminates the possibility that he could mistakenly make a match simply because detectives already had a theory about whose hands touched an object. Mackin’s testimony had supported the prosecution’s contention that Hernandez, driving a rented Nissan Altima, had driven two alleged accomplices, Ernest Wallace Jr. and Carlos Ortiz, from North Attleboro, Mass., to Boston, where they picked up Odin Lloyd prior to the 27-year-old’s murder. Jurors had already been shown surveillance video that included the former New England Patriots tight end stopping to get gasoline on the way to Boston as well as video showing the Altima pulling up outside Lloyd’s home early the morning of June 17, 2013. Lloyd’s sister, Shaquilla Thibou, identified him in the second video getting into the rear seat on the passenger side of the Nissan. * Ortiz’s fingerprints were found on the inside door handle on the rear, driver’s side door. * Wallace’s prints were found on the inside of the driver’s window, the driver’s side seat belt latch, the front passenger inside door handle and the rear passenger door window. * Lloyd’s prints were found on the inside door handle on the rear, passenger side door. * Hernandez’s prints were found on the inside driver’s side door handle. Sultan pounced on the testimony that Hernandez’s fingerprints were inside the driver’s door of the Altima. A detailed look at the multiple criminal charges against Aaron Hernandez and the allegations and events that led to them. "You have absolutely no idea when those prints were left, do you?" Sultan asked. "You would agree with me that If someone rented a car and then returned that car driving it, you wouldn’t be surprised to find that person’s fingerprints on the inside driver’s door handle, would you?" Sultan asked. Sultan asked no questions about the presence of the prints of Ortiz, Wallace and Lloyd. But he stressed repeatedly that there is a human element to fingerprint identification – noting, for example, that there is no accepted standard on how many points must line up between two prints for a match to be declared. Hernandez faces one count of murder and two firearms charges in the slaying of Lloyd, a semi-professional football player who was dating Shaneah Jenkins, the sister of Hernandez’s fiancée. Although prosecutors have not said who they believe fired the fatal shots, they have asserted that Hernandez "orchestrated" the killing. Ortiz and Wallace have also been charged with murder and will be tried separately. Under a Massachusetts law known as "joint venture," a person can be convicted of murder even if someone else carried out the actual killing. To prove that, prosecutors would have to prove that the person knowingly participated in the killing and did so with intent. Sports News To Your Inbox! Sultan also spent time Wednesday eliciting testimony from Mackin that no one fingerprinted a bag – which looked like one that could be used as a shaving kit – that was discovered inside a rented Chevrolet Suburban parked outside Lloyd’s home. That vehicle had been rented by Hernandez. Earlier testimony suggested that Lloyd used the zippered bag to keep supplies he needed to roll marijuana cigarettes. Sultan suggested that Mackin had testified untruthfully when he failed to acknowledge that in addition to Lloyd’s fingerprints he found one belonging to a man named Darryl Hodge in the Suburban. Hodge was a teammate of Lloyd’s on the Boston Bandits football team. And Sultan also asked Mackin about something he did that didn’t have to do with fingerprints. He was one of the officers who responded to Enterprise Rent-A-Car after a manager there told investigators she had cleaned out the Altima and thrown a shell casing, a piece of paper, some chewed bubble gum and a Vitamin Water bottle. The gum and the shell casing were stuck together when they were found. Mackin testified that he put on a pair of gloves and separated the gum from the shell casing. But Mackin acknowledged he didn’t document separating the items in his written report on the case. "Did you just not consider that important enough to put it in your report, sir?" Sultan asked. "That I separated it?" Mackin replied. 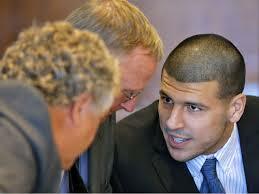 There was also news outside the jury’s presence Wednesday: During a morning break, Judge E. Susan Garsh affirmed an earlier ruling that a man who accused Hernandez of shooting him in Florida in 2013 will not be allowed to tell the jury about the incident. Alexander Bradley, in a civil lawsuit, accused Hernandez of shooting him in the face after a dispute at a nightclub, but he refused to cooperate with authorities and no criminal charges were filed. Garsh had earlier ruled that the so-called "prior bad act" evidence could not be introduced. Prosecutors argued in a new motion that the defense’s continual reference to Hernandez and Lloyd as friends – and the implication that the former football star would not shoot a friend – opened the door for Bradley to testify. Garsh, however, ruled that the defense has not done anything to warrant a change in her earlier ruling. That trial originally was scheduled to begin May 28, but the judge there indicated recently he would push it back given the anticipated length of the trial in the Lloyd case. No new trial date has been set.